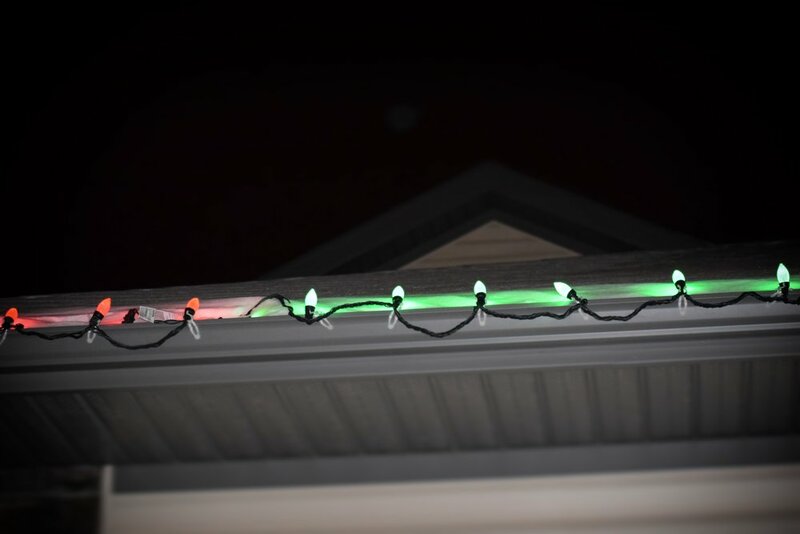 After years of loyalty to the incomparable glow of incandescent Christmas lights, my family decided that this year we would take the environmentally kinder step of outfitting our eaves in LED. I'd fought against it for the past few seasons reasoning that we already owned our old energy-inefficient strands, but invariably a few glass bulbs would break and we'd have to buy more anyway. It was finally time to give in. So, we went shopping and discovered there's a lot of variety in the world of outdoor Christmas lights as of late, most of it being LED: solid and multicoloured C9s, classic and dripping icicles, mini, all-white, rope, and of course, the programmable-from-your-phone AppLights. I liked the idea of being able to switch things up (mm hm, that's a lighting pun) and my husband Tyler liked the idea of not buying another string of lights for years to come, so we made the investment (about $200 for 3 strands) and went home to put them up. Did AppLights make the grade? Here's our review. Taking them out of the box and unravelling them was easy compared to our tangled mess of oldies, possibly due to how thick the rope is. Every possible colour combo requires every wire ever invented, apparently, and although it makes the out-of-the-box experience simple, we instantly wondered how our clips would hold up. Back out he went and somehow, with a lot of NSFW language and a graveyard of snapped-in-half clips on our driveway, he made it work. Then, a new problem: the AppLight bulbs aren't removable so getting them to fit perfectly across our house meant Tyler would have to slide them all closer together. Starting from the other side. After a coffee break, the spacing got finished and I couldn't wait for dusk. We decided to try out the St. Patrick's Day green pattern since it was a Roughrider game day and I've gotta say, it looked great! The app is easy to operate and has lighting patterns for every holiday you can think of should you choose to leave them up year round (I am not okay with this on my house but you do you), and the Christmas pre-sets are nearly endless. The above ad illustrates it better than my photos. Very positive is that you can connect up to eight strands that can work in tandem to create a pattern *and* you can add other types of AppLights including candy cane lane markers, icicles, and kaleidoscope projectors. Fast forward five years and our house will rival Christmas Vacation. Little bothersome bits include: You have to be close to the lights in order for the app to connect to them, a minor complaint. And, we had one strand that was obviously bought and returned before we purchased it and had already been connected to someone else's phone. If this happens to you, DO NOT HANG but rather IMMEDIATELY RETURN it because you're in for a slew of annoyances i.e. it not connecting properly to the pattern you choose and being very difficult to reprogram despite the instructions assurances which will assure you, in bad Mandarin-to-English translation, that it's possible. We ended up guessing the previous owner's password but wow. Aaand the rope being super thick, you might have to get up on the ladder again to pop a bulb back into a clip here and there. All in all, AppLight might be a little more frustrating than other strands but they're so pretty at night that you can probably overlook the little annoyances. Especially if you didn't help.